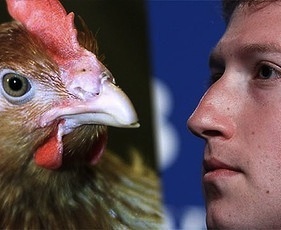 Literally so, that is – Mark Zuckerberg has revealed how he will only eat meat from animals that he himself have killed. Jamie Oliver may be pleased to hear how Zuckerberg is raising consciousness about where we get our meat from – after all those school children are having all that trouble making the connection between a chicken nugget and a real live hen. Zuckerberg is no longer having this problem, having personally overseen the demise of chickens, goats, pigs and lobsters. This causes some problems when going out to restaurants, granted, but instead of marching into the kitchen demanding to know where they keep the cleavers, Zuckerberg says he mostly stays veggie under those circumstances. merci pour le partage, il s’agit d’un post-Nice, la Grande! Nice way to keep himself healthy and also experiencing something new in his life. Sure it is a new thing I came to know about the social king Mark.